Aside from tablecloths, high quality table skirts are excellent table linen options when creating extra special event tables such as sweetheart tables, cake tables, gift tables, buffet tables, trade show display tables, giveaway tables, etc. Also known as table skirting, these table linens feature a Velcro-like strip for ease of attachment to table skirt clips. 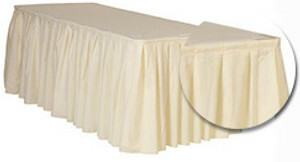 Your Chair Covers offers two table skirt sizes, 17 ft. x 29 inch and 21 ft. x 29 inch. Both sizes are available in three colors, white, black and ivory. 17' x 29" and 21' x 29"
We always strive to expand our collection of commercial grade event and hospitality linens here at Your Chair Covers. As one of the leading global suppliers of premier table linens, we make product expansion decisions based on what matters to our clients coming from various parts of the hotel, wedding and restaurant industry. With the addition of our table skirts or table skirting, we hope to be able to fulfill the linen tablecloth and table skirting needs of the businesses we cater to as well as their customers. You can expect that we will continue to add tablecloths, table runners, chair sashes and cloth napkins to our huge product selection. 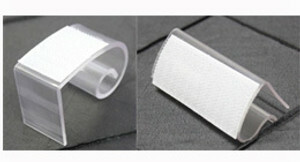 We also offer table skirting clips that complement our table skirts. If you are in Los Angeles County and Orange County in California, you are welcome to stop by at our corporate office and warehousing facility in Sun Valley. We are offering pick-up options (will call) for Greater Los Angeles, San Diego, Orange County and downtown LA linen shoppers. 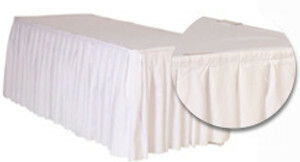 We recommend placing the order for table skirts online then select "Local Pick Up" as shipping method at checkout. If you prefer to place the order over the phone, we can do that for you too! To be more efficient, just give us a call at least an hour before your intended pick-up time.